When my beloved PM Shri Narendrabhai Modi, you expanded your cabinet and included 21 new ministers, as an activist for Specially Abled People, immediately I got a question in my mind, why don’t we have a dedicated ministry for our specially abled people? 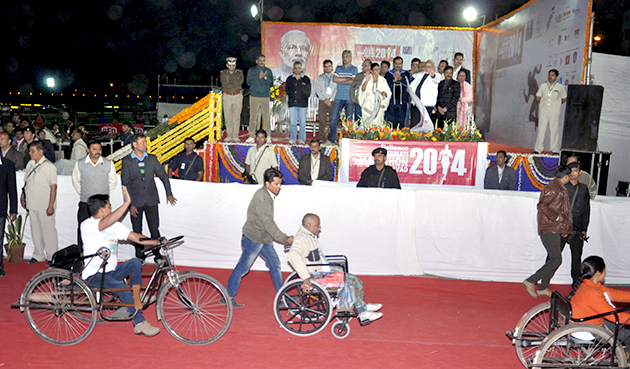 Any healthy democracy can not run without proper representation of its all the sections of the society and especially when we have a huge population of nearly 100 millions of specially abled people, they need proper representation. I am not requesting special quota while distributing tickets for MP or MLA, that also can be done, but after the empowerment of SAP. But out of these 100 millions’ population of SAP, if we could induct any one specially abled person as a Minister of Empowerment of SAP, or at least create this ministry and give its charge to any one of the suitable, present minister. Why should we create Ministry of Empowerment of SAP? 1. Huge population of around 100 millions, is without any representation in the world’s biggest democracy. 2. PM’s very well known affection towards SAP. 3. There are a lots of issues related to SAPs which required immediate attention and speedy solutions. 4. Though SAPs need attention from all the ministries of India, A dedicated minister can co-ordinate and concentrate only on it. For example, we (SAP) need help from social welfare ministry, finance ministry, human resource ministry, law and justice ministry, railways ministry, women and child development ministry, health ministry etc. Its very difficult to say to all these ministries to concentrate only on SAPs, and even that’s not practical also. So the dedicated ministry for SAPs can get things done via all the other ministries. 5. A dedicated ministry can start many initiatives which can directly affect the empowerment of SAPs. How can we expect other ministries to look after these many diversities of issues and their solutions? So we need a dedicated ministry. 7. BJP’s 7 commitments in its manifesto towards SAP. Its possible to implement all of them, but if it is left to various ministries, it will take much more time then expected. 8. It would be a wonderful initiative of your Government and you will be blessed by all those 100 million + SAPs, no one has done it so far, and you are very well known for taking novel initiatives. 9. Ministry of Empowement of SAPs will generate lots of new jobs as well as new opportunities and records never achieved! For example, FM has allowed 100% FDI in SAP’s sector, but who is dedicated towards bringing this FDI? Because, to bring FDI we need new initiatives, for that lots of deliberations required and all the other ministries are loaded with their own responsibilities. But if there is a dedicated ministry, it will, can work towards this end, which will improve overall economic health of the country. 10. My dear PM, you did wonderful works for SAPs as Chief minister of Gujarat, and SAPs of Gujarat are still remembering you.. But as PM you have a lot of responsibilities, so even after having immense love and affection you can’t dedicate yourself 100% only for the cause of SAPs. So, My Dear PM, sorry for indulging in advising you, i don’t have that capacity, but still I have shared my feelings as your younger brother, hope you will think on it and may be you agree and we will have a special Ministry of Empowerment of SAPs.